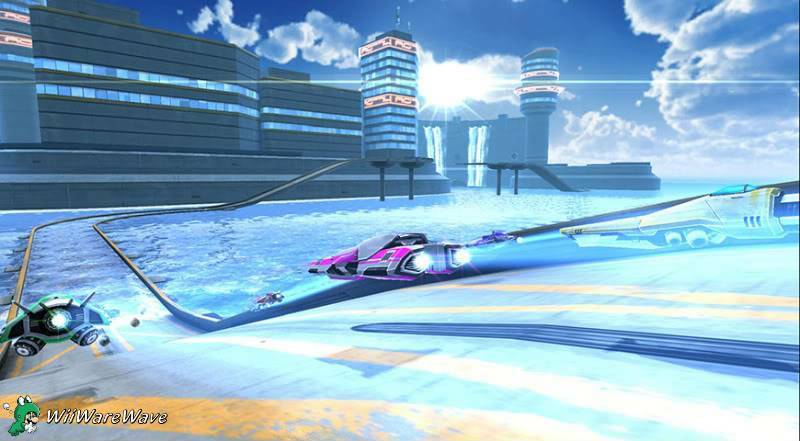 In the future racing will evolve and phase shifting will become necessary to complete many insane tracks! So is this game going to win you over or does it crash and burn? Let's find out. 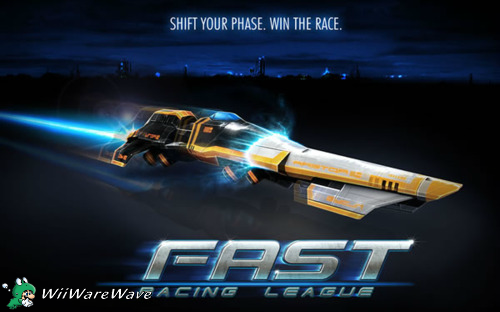 Fast Racing League Features 12 massive tracks set across 3 separate leagues as well as nearly 10 futuristic race cars. This game also features challenges that are set on unique courses and range from collecting items to a dangerous sprint race and will truly test your mettle! The AI in this game are challenging even on the easiest difficulties. The most unique feature and most difficult to master however is phase shifting which changes your vehicle's primary color from white to black and is used to utilise speed boosters or ramps and can even magnetise your race car causing it to ride on the underside of objects above you to pass safely across huge holes in the road! but these only work if your car is the same color as the phase shift zones e.g. a white zone will only work if your car is white! 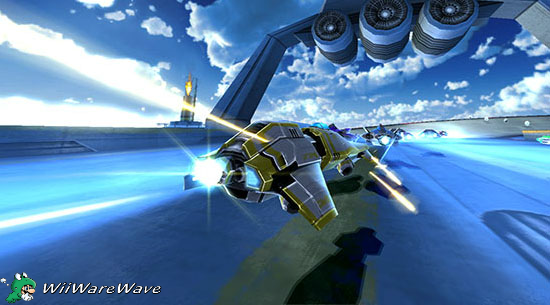 The graphics in Fast Racing League are every bit as good as retail games like Mariokart Wii or Super Mario Galaxy and are unrivaled on the WiiWare service as you'll see detailed scenery that will blow your minds such as giant sand tornadoes or lightning on certain tracks and these are just a couple examples of the scale of this game's graphics. This game also features a remarkable soundtrack that is among the best you'll hear on a WiiWare title! Bottom Line-If you like challenging futuristic racing games that has good CPU AI,and is blisteringly hard you should definitely download Fast Racing League. Cool! Think i might buy. Oh ! and I have something to post in a certain forum topic right now ! if this game had online i would have downloaded it day one. But since it dosent it falls on my priorities list. I didn't find the phase shifting as difficult as making sharp turns at nearly 500 mph. The later leagues can be unbelievably challenging. Well im not.saying its a bad game. Just that the inclusion of an online mode would give me more insentive to purchase it. I even go as far as saying MotoHeroz is not only the best racing game on WiiWare but the best racing game on Wii altogether. In direct comparison MotoHeroz has 75 single player tracks and 30 multiplayer tracks and future DLC while FAST has only 12 tracks (maybe 16). MotoHeroz also has online, FAST has none. The music in MotoHeroz is much better than what I've heard in FAST as well. And the graphics are about equal. Both have very crisp textures, smooth polygons, great design, fluid framerates, and they're visually some of the best you can find on WiiWare. But MotoHeroz is having an edge over FAST because it has much more variety, ultrarealistic physics and is much more charming. And on a personal side, F-Zero GX (Gamecube, 2003) did everything FAST did much better 8 years ago, but yeah, it's not fair to compare a 1000MB Triple-A-Class Gamecube racer to a 40MB WiiWare title. MotoHeroz is a clear 10/10. FAST is still a very good 8/10. FAST is still a very good 9/10. Hey Kain, why don't you write up a member review instead. I'm going to do one for Go Vacation. The forum is at the very bottom of the homepage. I just tried this as a WiiWare demo. Looks like it uses the same engine as Jett Rocket, which was exquisite. Definitely going into my queue. I bought this the day it was released because I knew this was going to be a rockin' good game. gosh now i really want this. I just got the demo for this game. AND NOW I WANT IT!!!!!!! This is a very nice review. Thank you for all of your positive comments. I'm looking forward to Fast Racing Neo!